In 1725 a group of colliers petitioned the Kirk Session of Newton Parish Church to have a loft or gallery built inside the church for them. It was not unusual for trade guilds in larger towns and cities to have their own lofts. The petition by the 'colhewers belonging to Mr Biggar' was presented in April 1725 by two of them, James Pentland and James Stinson [Stevinson]. The Kirk Session agreed to it but asked that the colliers get consent from the heritors (landowners in the parish with a heritable obligation for the upkeep of the church). In 1732 their request was granted and a paper by the heritors was read out to the Kirk Session on 16 April agreeing to the building of the loft. In 1742 a new church was built. This time the request for another loft may have been made directly to the heritors as there is nothing in the session minutes. From the panel on the colliers loft, it seems they were granted permission in 1747. Access to this new loft was by a staircase built on the outside the church. 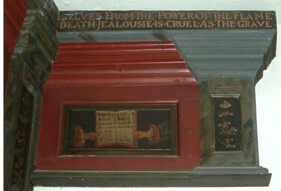 To celebrate these events, two boards, one dated 1732, and a another for 1747 were put up in the church bearing the names of the petitioning colliers. Panel commemorating the colliers responsible for the building of the first loft in 1732. From the way the panels including the biblical quotation, have been cut and put together, it seems that these are original panels taken from the old church. Panel commemorating the colliers responsible for the building of the new loft in 1747. This panel has been done in a very similar style to the older one, and has more biblical quotations also featuring coal. "ISA:VERS 14 BEHOLD THEY SHALL BE AS STUBBLE THE FIRE SHALL BURN THEM THEY SHALL NOT DELIVER THEM SELVES FROM THE POWER OF HIS FLAME [ missing -there shall not be a coal to warm at, nor fire to sit before it.] "
"SONG 8 VERS 6 SET ME AS A SEAL UPON THINE HEART AS A SEAL UPON THINE ARM FOR LOVE IS STRONG AS DEATH JEALOUSIE IS CRUEL AS THE GRAVE [ missing - the coals thereof are coals of fire, which hath a most vehement flame]"
My thanks to Mark Cameron for the original photos. 1732 - John Pentland, Abraham Steel, Abraham Moffat, Richard Boyd, Thomas Bennet, John Boyd, James Bennet, William Bell, Thomas Pentland. 1747 - Robert Archibald, Hugh Adam elder, Thomas Archibald, Hugh Adam younger, Henry Archibald, Henry Adam James Kinghorn, John Adam. There was presented a petition by the collhewers belonging to Mr Biggar desiring that the session would concurr wt them and give there consent for there building a Loft above the Hill gate, the session considering the same thought it would not be convenient above the Hill gate but if the Heritors give there consent it would be mor convenient one the other syd where the pillar stands and John Pentland and James St[ev]inson who presented the petition were calld in and the same intimat to them and the session desired them to get the Heritors consent and they should not be against it. The session closd wt prayer. I John Wauchop of Edmonstown patron of the church of Neatown do hereby consent and allow the coallhewers of the Lands of Woollmet and others to build a Lofft for there accomodation in the said church of Neaton reaching from the south wall to the north above the Elders seats befor the raill of Shiriffhall isle at the sight of the Kirk Session so high as it shall incomode the view of the said isle providing that the possesors and ussers of the said Loft shall be obleidged to keep the rooff of the church above the said Lofft alwayes in repair at their own charges and I as patron do likewise consent to the removing of the pillory in the said kirk in witness whereof I have sub[scribi]t thir pr[esen]ts writen be James Don advocat at Edmonstown the seventeenth day of Aprill one thousand seven hundred thirtieth and two years befor these witneses Mr Robert Marjoriebanks merchant in Edenburgh and the sd James Don. The which day the session mett according to appointment and Edmonstowns order for building a Lofft for the accomodation of the colliers and others in the Lands of Woollmet being again read John Pentland oversman to Mr Biggers Coallwork appeared in name of the said colliers and consented to the Termes and conditions appointed by Edmonstown in all the clauses thereof. And the session does agree and appoint that the jeasts of the said Lofft to be exactly three foot below the [ ] feet and to be ten foot in breadth and the pillory to be removed and set in the east end of Neatown Isle at the charge of the possesors and ussers of the sd Lofft and apponted Edmondtowns order to be keept in retentis and John Pentland to have a dowble of it and appointed John Pentland to subscrive the above in name of the rest which he did in there presence. Likeways there was given in be coalhewers belonging to Mr Biggers Coallworks twelve shillings scots and that for the Libberty of the stair that goeth up the steeple for ane entry to there lofft. The Session closd with prayer. Note - James Stevenson, who presented the first petiton with John Pentland is not commemorated on the board in the church possibly because he was in serious trouble with the Kirk Session in 1728 for adultery?.